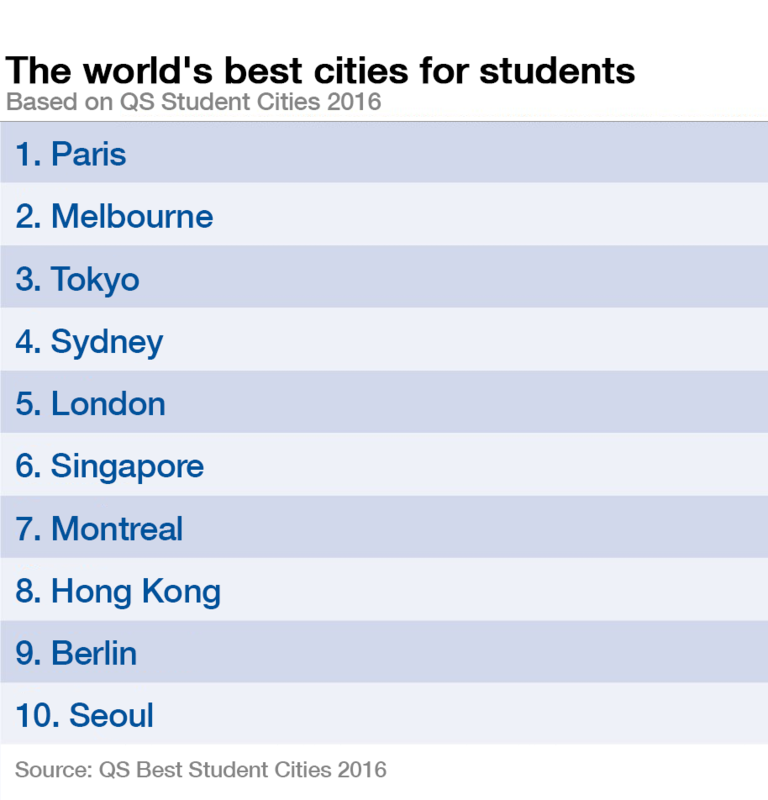 Paris has once again topped the list of Best Student Cities 2016 – for the fourth year running. What makes a great student city? According to university rankings organization QS, which compiles the Best Student Cities list, it’s one of five things: how many good universities the city plays hosts to ( its overall ranking in the QS world university rankings ), the size and diversity of the student mix, the desirability of the city, employer activity in the area and the affordability of a good standard of living. Paris is home to 18 universities featured in the latest QS World University Rankings, and is only outpaced by London, which has 19. But it’s the city itself which draws students, as “one of the world’s most historic, culturally vital and beautiful cities”, according to QS. That said, it’s an expensive city to live in – ranking 25th on affordability. This is mitigated by relatively lower tuition fees than other cities. The sunny city of Melbourne comes in second, scoring in the top 10 for student mix, desirability and employer activity. This includes coming top for the mix of students, which is calculated using the relative size and diversity of each city’s student population, as well as levels of social inclusion and tolerance. Melbourne also regularly tops the world’s best places to live lists , thanks to its sunny climate, beautiful beaches and cultural activity. Like Paris, though, living here comes at a price – it ranks only 45th for affordability. Tokyo first appeared in the top 10 last year, in seventh place. This year it has risen four places to third, making it Asia’s leading entry (with Hong Kong in eighth place and Seoul in 10th). It scores low on student mix (63rd), but enjoys a top 10 place for university rankings (fourth) – 13 internationally ranked universities are based here. It also scores well for desirability (fourth), which considers factors such as safety, quality of living, tolerance, transparency and pollution. Tokyo is also a leading finance centre, which means that students have good access to professional opportunities once they graduate – giving it the number one position on employer activity. Sydney ranks only three points below Tokyo. It doesn’t match Tokyo’s university or employer activity, but sits in the number one spot for desirability and outdoes Tokyo’s student mix score by a mile, coming in at number two, versus Tokyo’s 63. It is also considered as one of the world’s best places to live, thanks (like Melbourne) to its sunny climate, cultural activity and nearby beaches. London’s fortunes are declining. In 2014 it was beaten only by Paris, but the following year it was overtaken by Melbourne and Paris. This year it has to make do with fifth place, behind Paris, Melbourne, Tokyo and Sydney. It ranks number one for ranked universities, with 19, two of which are in the top 10. As might be expected from a multicultural city, it ranks highly on student mix (seventh), and has almost unparalleled access to employers (third). But its astronomical living and tuition costs mean that it ranks towards the bottom for affordability, in 75th place. Singapore gained nine places thanks to the progress made by its top universities in the QS World University Rankings. The city performs best on the desirability score (11th), renowned for its prosperity and low levels of crime and unemployment. It also scores well on employability (eighth). This Canadian city is North America’s only entry into the top 10, having moved up one place from last year. Montreal bags its strongest score for student mix (third) and comes 10th for desirability. The Chinese city comes high on the list thanks to the quality of its educational institutions (seventh) and desirability (15th). It’s let down by the cost of living, however. Europe has three cities on the list. While Berlin scores poorly for university rankings, it scores highly for desirability and affordability. “Germany's capital city can stake a credible claim to being one of the coolest cities in the world. During recent years, its cultural scene has flourished, turning it into a major centre of design, fashion, music and art to rival even New York or London ,” says the report. Seoul retained its 10th place form last year, and scores well in the “employer activity” category (fifth), which reflects the strong reputation of universities in Seoul. It also scores third on university rankings. There are 14 universities in Seoul featured within the QS World University Rankings 2015/16, the most rated of which is Seoul National University, at 36th in the world.